Readers around the world will have unprecedented access to Laura Ingalls Wilder’s account of her own pioneering experience beginning on Monday, Nov. 17. The South Dakota Historical Society Press will start shipping “Pioneer Girl: The Annotated Autobiography” that day. 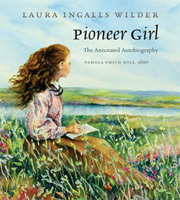 Written by Laura Ingalls Wilder, this much-anticipated volume is edited by Pamela Smith Hill and made possible through the Pioneer Girl Project, a program of the South Dakota State Historical Society. Advance reviews have already hailed “Pioneer Girl” as an important historical work that chronicles the true story of the Ingalls family. Extensive annotations accompany Wilder’s work, illuminating the hardships of the frontier and making the book truly comprehensive. To find advance reviews, media coverage and more information about the Pioneer Girl Project, visit www.pioneergirlproject.org. Through this website, project staff keep readers up-to-date with the book’s progress and share research that went into making this volume a must-read for any Wilder admirer. “Pioneer Girl” will be available for $39.95 plus shipping and tax and may be purchased from most bookstores or ordered directly from the South Dakota Historical Society Press. Visit www.pioneergirlproject.org or www.sdshspress.com, email orders@sdshspress.com or call (605) 773-6009. To become a supporter of the Pioneer Girl Project, please contact the South Dakota Historical Society Foundation at (605) 773-3458 or info@sdhsf.org. Donations can also be made on the foundation website at http://www.sdhsf.org/special_projects/pioneer.html.